Racism in Canada is communal. It differs from coast to coast. In the East there is a black and white struggle. In recent years this tension has escalated in towns across Nova Scotia. The youth in turn have become violent. Black Canadians have now brought the spirit of this struggle to the silver screen. The Film, Across the Line, is written by Nova Scotia native Floyd Kane. Toronto’s Julien Christian Lutz (aka Director X) helms the project, and fellow Torontonian Stephen James stars in it. Its story is inspired by the race riots of Cole Harbour High. It is the story of youth acting out their parents’ biases. 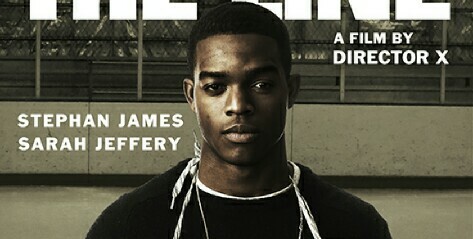 Stephen James plays Mattie Slaughter, an NHL-ready teen who has made the most out of the little life gave him. In his efforts to prep for the draft he must also navigate familial strife and local unrest. James’ real life brother, Shamier Anderson, plays his onscreen sibling as well. Carter Slaughter is a pimp who takes pride in his baby bro’s success.Mattie’s friends are proud too, but they all connect him to tensions he’d be better off without. Mattie must endure injustice, as well as watch it unfold around him. Rarely have Canadians broached the subject of racism with such tact. The problems of prejudice are discussed in the Film’s school. As the students plot against each other in the hallways they are challenged in the classroom. Sarah Jeffery plays Jayme Crawley, Mattie’s friend and love interest. As a bi-racial teen, Jayme is caught in the middle of her town’s troubles. When asked to read “The Hanging of Angelique,” she grows frustrated by the miscarriage of justice it unravels. Marie Joseph Angelique was a black Canadian slave desperate for freedom and destroyed by misunderstanding. Jayme’s world seems all too similar. She feels trapped in her town. And as she struggles to hold her life together, Mattie watches his fall apart. It’s an emotionally-intense 86 minutes. X’s direction is superb, and reminiscent of Hype Williams foray into Film. Across the Line invokes the spirit of Williams’ “Belly” as it discusses transcending the misfortunes of life. It’s a project Canada should be proud of. Across the Line is a thought provoking piece delivered by some of the country’s greatest artists. If the chance to see it arises, do. ACROSS THE LINE closes out the Canadian Film Fest Saturday, April 2, 2016. Details here.